The specialised branch of Paediatric Ophthalmology forms an integral part of the treatment of Noble Eye Care and is managed by specifically trained staff and surgeons. The speciality is run in a dedicated child friendly facility and is managed by experts with specialised training in this field. The clinic is a comprehensive setup for managing all ocular conditions in children and works in tandem with the other specialties to provide multidisciplinary care for ocular problems associated with other ocular and systemic conditions. The important diseases handled under this clinic include amblyopia, refractive error, retinopathy of prematurity, paediatric cataract, paediatric glaucoma and congenital ocular disorders. Paediatric/Pediatric ophthalmology is a sub-specialty of ophthalmology concerned with visual development and eye diseases in children. Paediatric ophthalmologists focus on the development of the visual system and the various diseases that disrupt visual development in infants and children. Paediatric ophthalmologists also has expertise in managing eye diseases that affect children. A Paediatric ophthalmologists is a super-specialist eye doctor who is specifically trained and qualified to manage diseases affecting the eyes in children and is experienced to perform complex eye surgery in the young population. With the growth in knowledge and management options more and more pediatricians and ophthalmologists are recognising this specialized field of eye care and referring children with eye diseases. Understanding eye problems in children is more complex than adults as children cannot explain their symptoms and are not cooperative for examination. 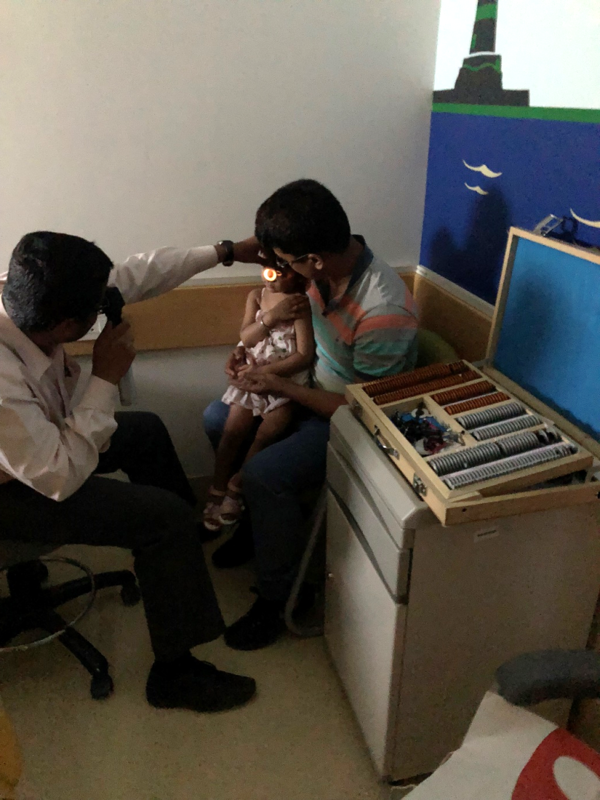 Additionally, there is a need for special equipment and vision charts for a proper eye checkup in the infants, toddlers and younger children. Most of all, proper eye evaluation in children requires keen observation which comes from special training and experience. Eye diseases in children are different from eye diseases in adults and present in a unique manner. Children may not be able to tell they are having eye trouble but signs such as reading from close distance, watching TV from close, have a face turn in one direction, head tilts, squinting of the eyes, frequent rubbing of the eyes, red eyes and difference in position of the eyelids point towards an eye problem. Paediatric ophthalmologists are trained to recognize and decipher the eye disease based on these presentations. Paediatric ophthalmologists typically also manage adults with eye movement disorders (such as nystagmus or strabismus) due to their familiarity with strabismus conditions. Why is it important to treat eye problems in childhood? It is very important to treat eye diseases in childhood itself. This is because many of these diseases may lead to a permanent vision impairment in adulthood if left untreated in childhood, even if they are treated in adulthood. If there is any eye disease that impacts the normal visual development in childhood such as presence of refractive error, squint, cataract etc, it leads to amblyopia or lazy eye development. This can only be treated in childhood as long as the brain is developing. After the brain has developed (usually by 7-11 years of age), it is not possible to improve vision any further. Another reason to manage eye disease in childhood is that if a child becomes blind or has severe vision loss, then there are many years of productive social and economic life which get impacted. This causes enormous strain on the child, family and society. Early treatment of many conditions can prevent this. Additionally, many conditions associated with blindness in children are also causes of child mortality (e.g. premature birth, measles, congenital rubella syndrome, vitamin A deficiency etc.). If these are recognized early, one may save the sight and life of the child. What is the magnitude of Eye problems in Children? Globally, 23 million children have vision problems, 95% of which can be corrected if detected and treated early. Over 10% of these problems manifest in the age group of 0-4 years. 86% don’t have eyes examined before first grade and only 14% have their eyes examined before age 18. There is a need to create awareness and change these practices. Refractive error is the need for glasses due to weak eyes. In all forms of refractive error, the eye is unable to focus the image onto the retina and requires corrective lenses in the form of spectacles. The most common form of refractive error is shortsightedness (myopia) which occurs in those eyes which are a little longer than normal and is treated with minus powered glasses. Other forms of refractive error in children could be hypermetropia (farsightedness) where the eye is shorter than normal and requires plus powered glasses, or astigmatism where the shape of the cornea is not spherical/round and requires a cylindrical lens for a clear vision. What is the magnitude of refractive error? Nearly 20% of blindness and 75% of visual impairment in the young is caused by refractive error. It is estimated that the prevalence of myopia in New Delhi school children (aged 5-15 years) is over 7%. How do I know that my child has a refractive error? Children with refractive errors may complain of not being able to see the blackboard or may watch TV from a close distance or may read their books from very close. If these signs are there, the child must be examined for the need of glasses. Sometimes, there may be repeated styes in the eyelid or frequent rubbing of eyes by the child. My child is very small and cannot read the eye charts. How will vision be assessed? In children who are too young to read the vision chart, special forms of vision assessment charts are available. These include special cards called Teller acuity cards or Cardiff acuity cards which can assess vision in 6 months to 3 years of age. Children between 3-5 years of age can be evaluated using picture and number charts. What is the correct method of checking the power of the eye in children? In children, the spectacle number has to be checked after putting some eye drops in the eye to relax the eye muscles. The power must not be given without doing the testing with these eye drops. Since all children have some power in their eyes as they grow up, it is important for the eye doctor to recognize that the power in a child is more than expected and then prescribe appropriate glasses. The power may be checked with either a computerised machine called auto-refractor or manually by doing retinoscopy. Is there anything else that should be done in a checkup? An important thing to check in the eyes of children with high minus powers is the retina, as there are sometimes areas of retinal weakness (which may require laser intervention), which are associated in these cases. In children with high plus power or difference in power between the two eyes, squint and lazy eye has to be ruled out. Will my child achieve good vision with glasses? With a proper refraction and constant use of glasses, good vision is almost always achieved. What are the risk factors for refractive error? There are many factors suspected to be associated with development of refractive errors. These include genetic factors (where parents have glasses), premature and low birth-weight, nutritional factors, spurt in height, environmental factors (near work, indoor activities, higher socioeconomic status) and eye diseases such as eye allergy. Why are more and more children getting glasses these days? The increased awareness among parents and regular screening in schools is helping pick up refractive errors which were hitherto missed. But there is also an actual increase in prevalence of some forms of refractive error eg. the increase in number of myopic persons in progressive generations can be attributed to increasing near tasks such as working on computer, video games, and television watching. When should I get my child screened for refractive error? It is important to screen all children for refractive errors at the age of 4 when they join school and then on yearly basis. What is the risk of not correcting a refractive error? Presence of uncorrected refractive errors can cause the child to fall back in class and have delayed learning and poor concentration in many activities. Uncorrected refractive errors can also cause amblyopia (lazy eye) and squint. What is Amblyopia? What is lazy eye? Amblyopia refers to reduced vision in one or both eyes due to either a squint or non-use of glasses in early childhood or an eye problem causing reduced quality of vision in the first decade. Generally, the eye examination shows an otherwise normal eye but with reduced vision. The prevalence of amblyopia in India is over 1% which implies that one in a hundred people are having this problem. It is commoner than we think. In amblyopia, one of the eyes is at a disadvantage, due to high power or squint, and becomes weak. If the causative factor is uncorrected, over time, the weaker eye becomes lazy and the brain reduces its ability to see. In older children full vision cannot be achieved even with glasses if the eye has become lazy. How do we diagnose and prevent amblyopia? When should I get my child screened for amblyopia? It is important to screen all children for refractive errors and amblyopia at the age of 4 when they join school. The earlier the amblyopia is picked up the faster and better the recovery. The treatment for amblyopia is best done at an early age and involves giving glasses and patching of one of the eyes and/or squint surgery. Amblyopia is like a fight between two opponents. If one of them is weak then the other one becomes dominant and the weak becomes weaker. In occlusion therapy for amblyopia, the dominant eye is closed with a patch for few hours or days giving time and advantage to the weak eye to improve its vision. This forces the brain to form new nerve connections and restructure the existing ones to enhance vision in the amblyopic eye. Since this process can take place only when the brain is developing, it is best to treat amblyopia early. It is therefore important for the ophthalmologist to recognize this problem and provide appropriate therapy. My child is in the mid-teens now and amblyopia has been diagnosed. Is there any chance of treatment? Typically, recovery in amblyopia occurs upto the early teenage years. However if the child has never received patching therapy or been treated earlier, it is worth giving occlusion therapy a trial. Squint refers to misalignment of the two eyes whereby both the eyes are seeing in different directions. It is not only cosmetically bad looking but also reduces binocularity (the ability of the eyes to see together to perceive depth) and can cause amblyopia. What are the types of squint? There are many ways to classify squint. One of the methods is depending upon the type of misalignment i.e. squint can either be esotropia (inward deviation of the eye) or exotropia (outward deviation of the eye). Squint can be suspected simply by looking at the eyes. If both eyes are constantly or intermittently looking in different directions, there may be a squint. Children keeping an unusual head posture could also be having squint. For confirmation of squint, the eye doctor will perform a test known as the cover test whereby one eye will be covered to look for movement in the other eye. What is false squint or pseudosquint? Sometimes there is an appearance of a squint in young children but the eyes are actually looking in the same direction as confirmed by a cover test. This is called as pseudosquint or false squint and needs to be recognized since it does not require any treatment. What are the risk factors for squint? Risk factors for squint include: Family member with squint, Refractive error (glasses needed), Amblyopia (Lazy eye), Poor vision in one or both eyes, Retinopathy of prematurity and low birth weight. What is the connection between need for glasses and squint? A common cause for esotropia in children is high hypermetropia (need for high powered plus glasses). This form of squint gets corrected by giving the appropriate spectacles. In most of these cases, the correct power of glasses needed can only be achieved after putting an ointment in the eyes for 3 days and refraction on the fourth day. Since squint surgery can be avoided with glasses, proper eye power prescription is very important. What forms of squint will require surgery? Squint in which the eye is either constantly deviated inward or outward or upward will require surgery. If using spectacles does not correct the squint, surgery will be needed. Infantile esotropia is a form of esotropia seen from 4-6 months of age and is independent of the power of glasses and needs early surgery to achieve best cosmetic and functional results. Exotropia could also be present from the first year of life and is called infantile exotropia. This too needs early surgery to achieve good binocularity. My child does not squint all the time. Does this require surgery? One form of squint called intermittent exotropia is often seen in young children and adults. In this, there is occasional outward deviation of one of the eyes interspersed with periods of no squint. This form can be treated with glasses and eye exercises (pencil pushups) initially but may require surgery later in life. If it is becoming more prominent, then surgery may be needed in childhood too. What are the associations of squint? Squint may be associated with amblyopia (lazy eye). In this case this should ideally be treated before the squint surgery. Rarely, squint nay be associated with wriggley/dancing eye movements called nystagmus and these may require surgery too. What is done in squint surgery? In squint surgery, the surgeon adjusts the position of eye muscles, tightens them or loosens them to alter their strength. It may be done on one or more muscles in one or both eyes. Squint surgery is done after giving either general anaesthesia or local anaesthesia. Can squint recur after surgery? Yes, there is a small chance of recurrence of squint after surgery. This may require use of glasses or resurgery. In expert hands, the chances of success of a squint surgery is very high. Retinopathy of Prematurity (ROP) is an abnormality of the immature retina thought to be caused by the use of oxygen therapy in premature infants. It is on the rise in India as health facilitates are improving and more premature low birth weight babies are surviving. It is a vision-threatening condition in premature infants despite significant advances in neonatal medicine and ophthalmic care. The overall incidence of ROP in India varies from 20% to 52%. ROP is a biphasic disease with an initial phase of blood vessel loss in the retina followed by abnormal vessel proliferation. In the human fetus, retinal blood vessel development begins in the central part of the retina during the 4th month of gestation and reaches the ora serrata (the most anterior aspect of the retina) just before term. Hence, in infants born prematurely, the retina is incompletely vascularized, with a peripheral avascular zone, which persists if high level oxygen therapy is given. This non-vascularized retina becomes increasingly metabolically active without a blood supply and induces formation of new vessels (neovascularization) which are leaky and can cause tractional retinal detachments leading to blindness. What are the risk factors for ROP? Risk factors for ROP include: Prematurity (infants born under 32 weeks gestation), High levels of supplemental oxygen, Weight less than1500 grams (the lower the birth rate, the higher the risk), concurrent illnesses, Intra ventricular hemorrhage (bleeding into the brain), anemia, seizures, low heart rate, need for blood transfusions and delay in child breathing (apnea). Mothers who are heavy smokers, diabetics and had preeclampsia have a higher risk of babies with ROP. When should a child be screened for ROP? Selected preterm infants with a birth weight between 1500 and 2000 g or gestational age of more than 32 weeks with sickness like need of cardiorespiratory support, prolonged oxygen therapy, apnea of prematurity, anemia needing blood transfusion and neonatal sepsis or believed by their attending pediatrician or neonatologist to be at high risk. The first screening examination should be carried out at 31 weeks of gestation or 4 weeks of age, whichever is later. How is ROP screening done? ROP screening is done by an ophthalmologist with special training. Screening entails putting an eye drop in the eye to dilate the pupils and then examining the retina through an ophthalmoscope. To do so an ophthalmologist may put a small clip in the eye to keep the eyelids open and use an indentor to reach the hidden parts of the retina. The baby is often monitored by the pediatrician during this process. ROP is classified by anatomical zones, clock dial like location within the eye and stages of severity. Zone 1 is the center of the retina while zone 3 is the far peripheral retina. Stage 0 is the mildest form of ROP while Stage 5 is the most severe indicating total retinal detachment. Can there be other eye problems associated with ROP? ROP can be associated with corneal problems, cataracts, glaucoma, nystagmus (Wriggley eye movements), refractive errors along with the retinal changes and retinal detachment. What is the treatment for ROP? The ideal treatment of ROP is prevention. This can be done through good prenatal care to prevent premature deliveries and good neonatal care with monitored oxygen therapy and control of other risk factors in premature babies. Once ROP has developed, treatment includes cryotherapy (freezing of the retinal tissue) or laser therapy of the retina. Both therapies work by destroying a small part of the retina, thus reducing the need for oxygen and abnormal blood vessel growth. If a retinal detachment occurs, eye surgery is needed. This could be either scleral buckling (a band is placed around the globe of the eye) or vitrectomy (instruments are used to remove the vitreous gel from the eye and reposition the retina). In advanced stages of ROP, sometimes it is not possible to do any intervention to regain vision. Due to the difficulty of performing these surgeries on the small eyes of premature infants, these surgeries are usually performed only by a small number of specialists. Retinoblastoma refers to a rare childhood cancer which originates in the retina. Most often, retinoblastoma is unilateral (occurring in one eye) though in about 30% cases it may be bilateral (in both eyes). In the early stages, it is localized within the eyeball but over time it can spread to the lymph nodes, bones, bone marrow and central nervous system (brain and spinal cord). Children may be born with retinoblastoma, but the disease is rarely diagnosed at birth. Generally in bilateral cases, the disease is identified earlier than unilateral cases. Most children who begin treatment before the retinoblastoma has spread beyond the eye are cured. Unfortunately in developing countries like India, it is diagnosed late and has a high chance of fatality. Retinoblastoma has a genetic locus and it's possible for children to inherit a genetic mutation from their parents. How does a child with retinoblastoma present? Children with retinoblastoma may present with leucocoria (whitish appearance inside the eye), squint and eyelid swelling. Diagnosis is confirmed by an ophthalmologist after doing a dilatedeye examination and spotting gray-white tumours with foci of chalky-colored calcification. Ancillary studies that may provide diagnostic help are ultrasonography MRI and computed tomography. More advanced tumors are managed by enucleation (removal of the eyeball). After enuclaetion, an implant is placed in the orbit to provide a good cosmetic appearance with limited to good motility. Recently, with earlier diagnosis and mprovements in conservative methods of management such as chemotherapy and radiotherapy, more eyes are being preserved and enucleation rate is reducing. Other forms of treatment include thermotherapy, episcleral plaque brachytherapy, laser photocoagulation, or cryotherapy. The management of retinoblastoma is complex and requires knowledge and experience. Since treatment varies depending on number, size, and location of the tumors, each case must be individualized. What is glaucoma? Is glaucoma seen in children? Glaucoma is a progressive optic neuropathy (dmanage of the optic nerve) usually associated with raised eye pressure (intra ocular pressure/IOP). It is generally considered a disease of adults, occurring most frequently over the age of 40 but it may ne present from birth or develop in childhood as well. These forms of glaucoma present differently depending on the age at which they manifest. In cases of congenital glaucoma, babies are born with large sized corneas which may be hazy, may have excessive watering from the eyes and do not tolerate light. This appearnce of the eye is called buphthalmos . In older children, it may manifest as a rapidly increasing myopia while in adolescents, it is often asympotomatic. These forms of glaucoma are called congenital/developmental glaucoma or juvenile glaucoma. Apart from this, glaucoma may also develop in children after an eye injury or eye surgery. Primary congenital glaucoma (PCG) occurs in 1:10000 births and is more common in boys. Three fourths of the cases affect both eyes. Why does glaucoma occur in children? To understand the reason for high eye pressure in a simple manner, the eye can be thought of as a balloon filled with a liquid (called aqueous humor). This liquid is constantly being formed by a special apparatus and is constantly exiting the eye through a special area called the trabecular meshwork. Glaucoma develops due to the anomalous development of the anterior chamber angle. If the inflow and outflow is equal, the eye pressure is in a normal range. If the outflow decreases or faces more resistance, then the eye pressure starts to increase. In congenital glaucomas, this exit channel is malformed from birth and hampers the outflow of aqueous humor. This causes the eye pressure to rise. Since the eyeball is still in a developing state, the high pressure causes the cornea size to increase and the eyeball to elongate. The appearance of the eye eventually becomes like that of a bull called biphthalmos. The optic nerve which exits at the back of the eye is also damaged by the increased pressure in the eye and this causes irreversible vision loss. How is glaucoma diagnosed in children? The diagnosis of paediatric glaucoma is clinical taking into account the eyeball size, cornea size and appearance, eye pressure and optic nerve changes. In older children and adolescents, visual field testing may be possible to evaluate the extent of optic nerve damage. What is the treatment for glaucoma in children? Treatment is surgical in all cases of congenital glaucoma and most cases of juvenile glaucoma. Medications may also be used concomitant with the surgery or as a stop-gap measure till surgery is done.. The initial and subsequent evaluations often need to be performed under general anesthesia. The overall prognosis for vision depends upon how early the glaucoma was treated and extent of damage to cornea and optic nerve. In many cases, vision is subnormal even after glaucoma surgery. What is nasolacrimal duct obstruction? What can cause of watering from my child’s eyes? Nasolacrimal duct obstruction is a blockage of the lacrimal drainage system. In children the majority of nasolacrimal duct obstruction is congenital. 5% of normal new borns will have a blocked nasolacrimal duct. This blockage is usually at the site where the duct enters the nose. The blockage can be unilateral or bilateral. In 90% cases, it opens up spontaneously by the age of 1 year. Why is the nasolacrimal duct blocked? There is generally a thin membrane at the nsal end of the duct which blocks it bur sometimes there could be other causes. The nasolacrimal duct sac is filled at birth with clear amniotic fluid which gets infected after birth if the duct is obstructed. Children with Down syndrome, skull abnormalities such as craniosynostosis, and cleft palate are at higher risk of congenital nasolacrimnal duct obstruction. How do children with nasolacrimal duct obstruction present? Children with congenital NLDO present with history of tearing, mucous discharge and epiphora of one or both eyes. Sometimes, there may be swelling and infection in the lacrimal sac adjacent to the nose called dacryocystitis. There may be recurrent conjunctivitis in infants causing pink eye episodes. These symptoms are worse with a concurrent upper respiratory infection. How is nasolacrimal duct obstruction diagnosed? Diagnosis is confirmed by a regurgitation test in which if pressure is applied over the lacrimal sac there is a reflux of mucoid or mucopurulent material from the punctum. In few cases, a fluorescein dye disappearance test can be helpful. What is the treatment of nasolacrimal duct obstruction? What is the treatment of watering from my child’s eyes? Treatment of congenital lacrimal duct obstruction consists of initial observation for resolution and lacrimal massage, followed by probing of children with persistent duct obstruction. If probing fails, then surgical procedures including balloon dacryoplasty, nasolacrimal duct intubation or dacryocystorhinostomy may be needed. During episodes of pink eye, topical antibiotics are to be instilled in the eye. The procedures including probing will often be offered to families of infants 6 months or older. Often, the ophthalmologist who performs probings under general anesthesia or conscious sedation might decide to wait until the infant is older because of the reluctance of families to have their infant undergo general anesthesia and to allow full chance for the obstruction to spontaneously clear. What is conjunctivitis? What is the cause for red eye in children? Conjunctivitis is a common eye infection. It is an inflammation causing swelling and redness of the conjunctiva (thin covering of the white part of the eye an inner part of eyelids). It can be caused by an infection or an allergy. Infectious conjunctivitis is contagious and can be caused by either a viral or bacterial infection. It can spread through direct contact (handshake) or indirectly through fomites i.e. it can spread through contact with objects and surfaces which have been touched by an infected person’s discharge/tears. These could be towels, pillows, pens etc. It does not spread through looking inot the eyes of a person with conjunctivitis. It presents as redness or pink appearance of the eyes, swelling of the eyelids, discharge and watering from the eyes and irritation and light sensitivity. Symptoms usually develop within 24 to 72 hours of becoming infected and last from two days to three weeks. In bacterial conjunctivitis, both eyes are almost always infected and a gritty sensation with yellowish discharge is observed. In viral conjunctivitis, one or both eyes may be involved and redness, itching and excessive tearing (sometimes pink) occurs. Vision may be blurred in either case. Occasionally, the eyes may appear puffy. What is the treatment of conjunctivitis? For viral conjunctivitis, there is no specific treatment and symptoms are reduced through use of certain eyedrops and frequent cleaning of the outside of the eyes. Sometimes avoidance of bright lights is helpful. For bacterial conjunctivitis, antibiotic ointment or drops are needed along with other lubricating and anti-inflammatory eyedrops. Contact precautions and hand hygiene by the child and parent are needed to avoid spread to other persons. What is eye allergy? How does eye allergy present? In this increasingly polluted world with high levels of suspended particulate matter in the air, eye allergy in children is very common. This may present in the form of itching (which causes the child to rub the eyes often), burning sensation, frequent blinking, redness, sticky mucoid clear discharge and blurring of vision. Sometimes it may be associated with swelling of the eyelids or whitish spots appearing around the black cornea. What are the types of eye allergy? Eye allergies could either be seasonal (generally seen in the hotter months and called spring/summer catarrh) or non-seasonal (associated with air borne contact dermatitis or allergy to some specific item or associated with other allergies in the body). In severe forms, the allergies can affect the cornea and cause development of astigmatism. The cornea (clear outer layer of the eye) may become white or change shape and become conical or get thinned out if the child rubs the eye very frequently. Eye allergy is diagnosed clinically and does not need any investigations in most cases. What is the treatment for eye allergy? Treatment involves avoidance of the inciting agent, use of cold compresses over eyelids, eye drops and rarely oral medication. Additionally, many of the children with long term allergy require glasses. Eyedrops used for allergy involve steroids, antihistamines and lubricants. Unfortunately injudicious use of steroids can cause several eye problems such as development of cataract and glaucoma. Therefore, it is important to not self-medicate and go to a specialist for treatment. Seasonal allergy is a recurrent problem and may often require repeated or long term treatment. If parents recognize and treat allergy at an early stage, then most complications can be avoided. The lens is a biconvex structure that hangs behind the iris. Its diameter is about 3.5 mm at birth and it grows to about 10 mm by adulthood. There are three structural elements that constitute the lens: capsule, epithelium and fibers. The crystalline lens is a transparent structure that helps to refract light to be focused on the retina, along with the cornea. The lens is capable of changing its shape in order to modify the focal distance of the eye, so that it can focus on objects at different distances, thus allowing a clear image of the object to be formed on the retina. Cataract is the opacification of the crystalline lens. Cataracts result from protein denaturation, increased molecular weight of proteins, water vesicles between lens fibers, increasing proliferation and migration of the lens epithelium. Childhood cataract occurs worldwide and is an important cause of childhood blindness in many countries. Are cataracts seen in children? What causes cataract in children? Congenital cataracts occur in about 3 in 10 000 live births. Two-thirds of cases are bilateral. The cause of the cataract can be identified in about half of the cataractous eyes. Unilateral cataracts are usually isolated sporadic incidents, without a family history or systemic disease and effected infants are usually full-term and healthy. Cataract can be associated with ocular abnormalities, trauma, or an intrauterine infection such as rubella. Bilateral cataracts are often inherited and associated with other diseases. They require a full metabolic, infectious, systemic and genetic workup. Detailed eye examination is required for the density and morphology of the any lens opacity. Potential impact on visual function of cataract is assessed on the basis of the appearance of the red reflex and the quality of the fundus view on direct and indirect ophthalmoscopy. A very dense cataract occluding the pupil will preclude any view of the fundus. In case of pediatric cataract serology should be done for intrauterine infections. Dense cataracts require early surgery when the child is 4–6 weeks of age to prevent the development of stimulus deprivation amblyopia. If the severity is asymmetrical in bilateral cataracts, the eye with the denser cataract should be addressed first. Surgery may not require in partial cataracts if opacity is not central. Retinal detachment is a condition of the eye in which the retina (a thin membrane consisting of rods and cones and nerve fibres at the back of the eye) separates from the underlying tissue. In children this presents in the form of vision loss, visual field loss, whitish reflex (Leucocoria), and appearance of squint or shrinkage of the eyeball. In about 7% of cases both eyes are affected. It is much more common in adults than in children but may develop in children secondary to trauma, eye surgery or presence of genetic syndromes and high myopia. It may be associated with other eye abnormalities such as coloboma, cataract, retinopathy of prematurity or retinoblastoma etc. What are the types of retinal detachment in children? The commonest form of retinal detachment is rhegmatogenous retinal detachment which implies a retinal detachment associated with a tear or break in the retina. Another form of retinal detachment is called tractional retinal detachment. This is refers to a condition where there is a pull on the retina which causes it to get separated from the underlying tissue. It may be seen in special situations such as persistent fetal vasculature, retinopathy of prematurity (ROP) and uveitis (internal inflammation of the eye). A final form of retinal detachment called exudative retinal detachment is rarely in children. In this, accumulation of thick fluid behind the retina causes it to get lifted off the underlying tissue layer. It is seen in some diseases such as familial exudative vitreoretinopathy (FEVR) or coats disease. What is the treatment of retinal detachment? Management of retinal detachment in children is particularly challenging due to presence of underlying eye abnormalities, differences in anatomy of paediatric eyes and late presentation of the disease. The treatment of retinal detachment is surgical and generally, a complex vitrectomy surgery is required to help settle the retina. What is an eye coloboma? Coloboma is an eye abnormality that occurs due to maldvelopment of the eye in the fetus. Colobomas are missing pieces of tissue in structures that form the eye and may appear as notches or gaps in one of several parts of the eye. Commonly they are seen in the iris (colored part of the eye), retina (specialized light-sensitive tissue that lines the back of the eye) and choroid (the blood vessel layer under the retina). It may be present in one or both eyes. What are the symptoms and associations of eye coloboma? Colobomas cause decreased vision and squint if they affect the central part of the retina. In the iris, they cause a keyhole appearance but do not lead to vision loss. Sometimes colobomas are associated with other eye abnormalities such as microphthalmos (developmentally small abnormal eye), cataract, glaucoma and retinal detachments. Eyes with colobomas are at a higher risk for retinal detachment. Different types of coloboma occur in the eye depending on the location affected. They could be eyelid coloboma, iris coloboma, lens coloboma, chorio-retinal coloboma, optic nerve coloboma and uveal coloboma. What is the treatment of eye coloboma? Unfortunately, treatment option are limited and deal with the complications of coloboma such as cataract, glaucoma and retinal detachment. In iris coloboma and lens coloboma, no treatment is usually needed. In uveal and retino-choroidal coloboma, a laser of the retina is done around the coloboma boundary to reduce the risk of retinal detachment. Visual rehabilitation and cosmetic squint surgery may be needed in eyes with poor vision. You need to make an appointment? Select your doctor for more information.